This article is a short summary of Dance Dance Revolution: Mario Mix. 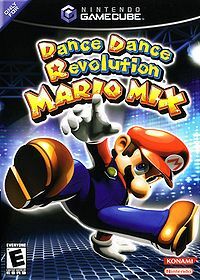 Dance Dance Revolution: Mario Mix is a Super Mario-themed game in Konami's Dance Dance Revolution series. The game was released for the Nintendo GameCube in 2005, becoming the first game in the series to be released for Nintendo hardware outside of Japan. Copies of the game were bundled with the Nintendo GameCube Action Pad, a dance pad that is required to play the game. Turn Mush Mode on to finally experience the thrill of stomping Goombas and other enemies firsthand–or foot! Grab a friend and throw your own dance party! Whoever's got the best moves wins! There's more to Mario Mix than just dancing! Unlock extra songs and minigames in Story Mode and play them over and over! In the game's opening, Waluigi tries to steal the four Music Keys from Truffle Towers. However, he is only able to take one of them, as the other keys are scattered across the kingdom. Toad, having witnessed the events at the tower, heads to the house of Mario, who goes on a quest to retrieve the keys from across the world. This page was last edited on 4 December 2016, at 05:44.